Eleven teams attended the Wanamaker Regatta on June 20, 2015. The fleet sailed three races in a 6-12 knot southeast breeze on the Seaside course. 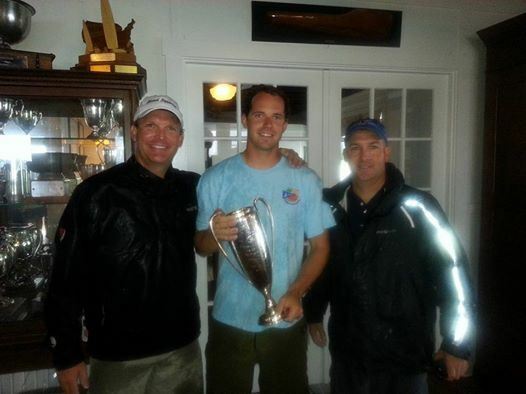 PRO Chip Hillyer and crew ran two and three lap windward-leeward courses with an average race time of 45 minutes. Race 1 started with an undecided fleet sailing to all parts of the course. Some boats looked left for a geographic shift to bend off the land toward seaside while others favored the stronger, steadier breeze on the right side. It was apparent there was more than one way to windward mark when the top boats came from all different directions. Brian Gabriel (T-53) led around to the first mark followed closely by Dave Magno (LA-99) and Erik Johnson (T-18). Close to land at the top of the course it was difficult to line up for the next puff downwind. Most times it was actually helpful to look downwind and use the lighter spots to anticipate stronger breeze filling from behind. Kyle Rogachenko (T-76) and LA-99 sailed farthest to opposite edges of the race course and led at the bottom of the leg splitting the gates. Coming together several times upwind LA-99 showed great finesse with the ability to holding a higher lane than any boat in the fleet. A final right shift at the top of the leg gave T-76 the lead around the final windward mark. Consciously positioning themselves between LA-99 and the next mark, T-76 held onto the lead until the downwind finish. Race 2 was lengthened to three laps. Stronger steadier breeze on the right side of the course again brought T-53 to the windward mark in the lead followed by T-76. Chad Hillyer (T-17) showed great downwind speed sailing higher than most boats in the light spots and pushing low to stay in the puffs as long as possible. T-17 passed several boats to jump back up into the top group. T-53 and T-76 held the top two spots until the bottom gate where they split to opposite sides. Picking up the small shifts and crossing when you can was the key for the final two laps. In the end, T-76 lead followed by T-17 and LA-99. Race 3 was back to two laps and raced in 10-12 knots, the strongest breeze of the day. Shorter shifts gave a big advantage to boats able to tack on the edge of the next line of pressure. There was much more gybing downwind as boats jockeyed to stay in the center of each breeze line. Winning the race and sweeping the day was Kyle Rogachenko on T-76 with crew Will Demand and George Demand.